WASHINGTON — New Democracy today released a policy report by Senior Advisor Paul Bledsoe, former Climate Change Task Force staffer under President Clinton , offering different Democrats in different political regions a positive, can-do, pro-economic growth energy and climate vision that reclaims the support of working- and middle-class Americans around the country, enriches our nation, and protects our people and future in the process. “For more than a generation, Democrats have valiantly advocated policies to combat the serious problem of climate change,” writes Bledsoe . “But they have usually done so with indifference or disdain for the economic and energy views of most voters. The result has usually been electoral calamity for Democrats. “Yet today, denial of climate change science facts and questionably coal-centric energy policies by President Trump and many Republicans have created unique new opportunity. Democrats must seize the day and put forward an economically powerful energy and climate protection agenda, one that can beat Republican decisively at the ballot box, and be effective and popular policy. America can both deliver energy abundance and climate protection by embracing gas as a key clean fuel that allows renewable energy to grow, while creating jobs in the process. In communicating this message to voters, candidates should also focus on economic benefits first, and climate benefits second, Bledsoe argues. Guided by President Obama’s pro-energy, pro-climate agenda, the U.S. energy economy –including natural gas and renewable energy – boomed. While U.S. greenhouse gas emissions fell more than 12 percent, the overall economy grew by 15 percent. Conor Lamb, Pennsylvania’s 2018 special election candidate, also ran on a platform which highlighted the opportunities provided by natural gas. 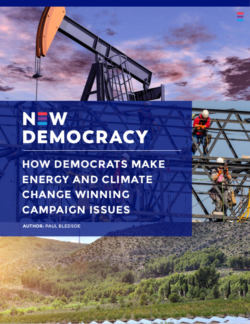 The report outlines 20 campaign approaches to talking about how Democrats can deliver American energy abundance and climate protection at the same time, and use gas as a clean fuel that allows renewable energy to grow.